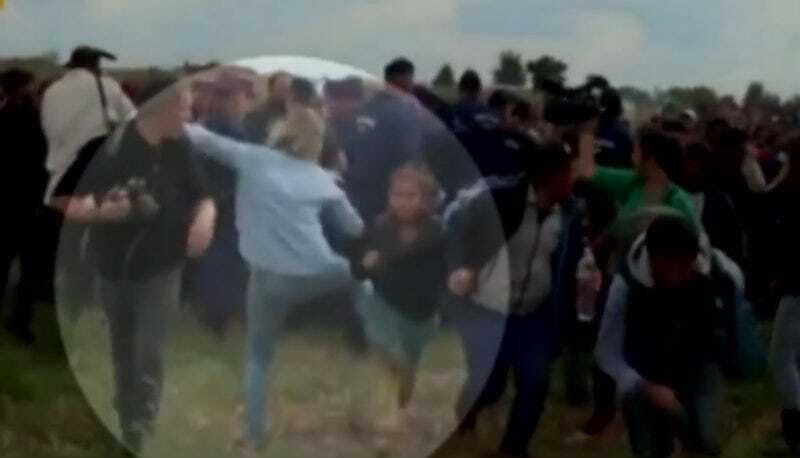 A camerawoman for a Hungarian news station has been fired after other reporters filmed her kicking and tripping migrant refugees, including children, as they ran from police. The incident happened near the Hungarian-Serbian border, where hundreds of refugees broke through police lines and ran to hide in nearby wheat fields after being detained for hours. That hostility is also echoed by some Hungarian citizens. The migrants fled Hungarian police today after being detained without explanation in a field for hours. Laszlo filmed the refugees as they ran, but dropped her camera to kick and trip them. N1TV wrote on Facebook that she “behaved unacceptably” and her employment has been terminated.